Today I have created this card chow-casing a technique using distress inks. I really like distress inks since they are so versatile. I created that piece using Spun Sugar, Picked Raspberry, Shaded Lilac and Shipped Sapphire distress inks. Once I had created that piece I die cut the Happy die from Simon Says Stamp and embossed it with some Black Sparkle embossing powder from Ranger. 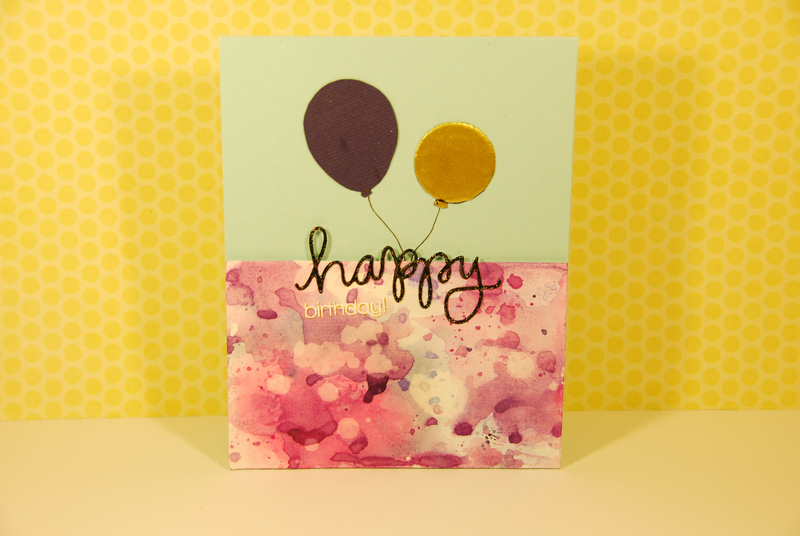 I then stamped the birthday stamp from the Happy stamp set from Simon Says Stamp. Next I adhered the water-coloured piece down using some foam squares and then the happy die cut to that. I also adhered an embossed balloon from the Birthday Balloons stamp set from Simon Says Stamp and a die cut balloon from the Balloons wafer thin dies from Simon Says Stamp. I drew the string and the card was done.